Completely revised text by popular author Mike Yaconelli and lavish full-color illustrations give this old favorite a new lease of life! An irresistible small gift for anyone seeking inspiration on life's journey. 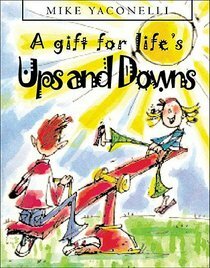 About "A Gift For Life's Ups and Downs"
Mike Yaconelli was the founder of Youth Specialties. He spent 43 years of his life in ministry to youth, and 20 years as a pastor of a small church in Yreka, California (in recent years, Mike called it "the slowest growing church in America"). Mike and his wife, Karla, split their time between Yreka and San Diego. Mike speaks on the Heart of Youth Ministry training video, wrote The Disciple Experiment: A Faith-In-Action Student Journal and dozens of other youth ministry books. Mike was also the author of Dangerous Wonder: The Adventure of Childlike Faith, and Messy Spirituality: God's Annoying Love for Imperfect People, which are both available in book stores or online from Youth Specialties. Before Mike passed away in October of 2003, he wrote two more books for Youth Specialties: The CORE Realities of Youth Ministry and Devotion. His fingerprints are all over Youth Specialties and this websiteyou can't miss his presence here!